Her name is Redoshi, although those who enslaved her called her Sally Smith. She refused to be lost to history and more than 70 years after her death, Ms Redoshi’s life is gaining global attention and making researchers revisit the inhumanity of enslavement, and the cruelty visited on people of African descent by many Americans of European descent. Ms Redoshi was one of 116 West African children and young people taken to the USA on the Clotilda, the last slave ship to arrive in the country. She was bought by Washington Smith, owner of the Bogue Chitto plantation in Dallas County, Alabama and who was also a founder of the Bank of Selma. The findings by an academic at Newcastle University, UK, shows that although Ms Redoshi lived through tremendous trauma and separation, she carried herself with a sense of pride. Her resistance, either through her effort to own her own land in America or in smaller acts like keeping her West African beliefs alive, taking care in her appearance and her home and the joy she took in meeting a fellow African in the 1930s, help to show who she was. Dr Hannah Durkin’s painstaking research pieces together Ms Redoshi’s life from her kidnapping in West Africa and enslavement in Alabama, to her eventual freedom. The study also highlights her close association with civil rights activism right from the start of the U.S. Civil Rights Movement. More than 70 years ago, Ms Redoshi was the subject of a newspaper article by the Harlem Renaissance author Zora Neale Hurston. She also appeared in several sources, including a film which contains the only known footage of a female transatlantic slavery survivor. Ms Redoshi is mentioned in the memoir of civil rights activist Amelia Boynton Robinson, the woman who invited Dr Martin Luther King Jr to Selma, and which culminated in the Selma to Montgomery marches. In her book she recalls Ms Redoshi, describing the contrast between her peaceful life in West Africa and the suffering she endured at the hands of white men. Boynton Robinson also reveals Ms Redoshi’s captors forced her to become a child bride while she was on the Clotilda. Ms Redoshi was enslaved for nearly five years and worked in both the house and the fields of her enslavers. Her husband, who was known as William or Billy, was kidnapped with her and died in the 1910s or 1920s. 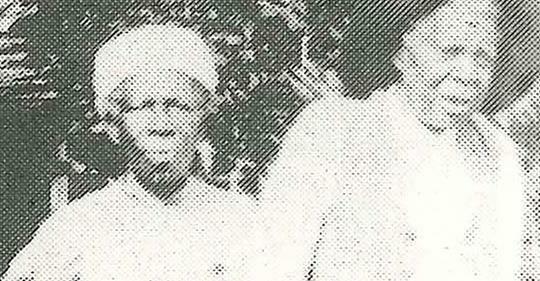 Following emancipation, Ms Redoshi continued to live with her daughter on the plantation where she was enslaved. Dr Durkin first became aware of Redoshi while carrying out other research. After spotting references to Redoshi in writings by Ms Hurston, she started delving deeper and established that it was possible to map out her life story across a variety of texts. “These materials add hugely to our understanding of transatlantic slavery as a lived experience,” says Dr Durkin, Lecturer in Literature and Film in Newcastle University’s School of English Literature, Language and Linguistics. “Now we know that its horrors endured in living memory until 1937, and they allow us to meaningfully consider slavery from a West African woman’s perspective for the first time. “The only other documents we have of African women’s experiences of transatlantic slavery are fleeting allusions that were typically recorded by slave owners, so it is incredible to be able to tell Redoshi’s life story. The last survivor of the transatlantic slave trade was previously believed to be Oluale Kossola, who was also known as Cudjo Lewis. However, Dr Durkin’s research shows that Redoshi died in 1937, two years after the death of Kossola/Cudjo in 1935. Picture: Courtesy of Newcastle University, UK.